Tony Pulis had the wood on West Bromwich when he was Stoke boss and, with Crystal Palace looking more likely to stay up than the Baggies, the bookmakers who are offering odds of 2.50 about an Eagles victory should get ready for business. Paddy Power, Stan James and William Hill are three of the bookmakers who are betting that Pulis will not experience more joy against West Bromwich now that he is in charge of Crystal Palace, the side that looked dead and buried before the former Stoke manager breezed into Selhurst Park. Crystal Palace has been a revelation since Pulis succeeded Ian Holloway, particularly at home. 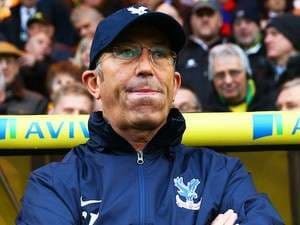 Crystal Palace has won four, drawn one and lost one of its six Selhurst Park games under Pulis. To put it simply, Crystal Palace has collected 13 home points from six matches under Pulis compared to four home points from six games under every other coach. And both of Crystal Palace’s away victories have come under Pulis. West Bromwich sacked Steve Clarke and hired Pepe Mel midway through the season and the results have not been as positive as those that Crystal Palace has experienced following its managerial change. Mel joined West Bromwich on 9 January – just days after the Baggies lost 0-2 at home to Crystal Palace in the English FA Cup third round – and the former Betis boss has yet to see his new team celebrate a win. Since upsetting Manchester United 2-1 at Old Trafford five months ago, West Bromwich’s nine English Premier League away matches have resulted in five losses, four draws and zero wins, including a heart-breaking 3-4 defeat at traditional rival Aston Villa after the Baggies led 2-0 very early on. With every passing round it is becoming more as case of when Crystal Palace avoids relegation from the English Premier League rather than if it does. Pulis is a handful of extra victories away from pulling off one of the great salvage operations and the Eagles, who made five signings on the final day before the transfer window closed, believe that they have what it takes to finish outside the drop zone. Another English Premier League relegation candidate that is heading in the right direction is Sunderland and the Black Cats are attractively priced at odds of 2.10 with Sky Bet, to beat Hull and leapfrog the Tigers on the ladder. Adam Johnson is playing out of his skin for Sunderland and Black Cats manager Gus Poyet has done a remarkable job in clearing up the mess that Paolo Di Canio left behind and steering the club not only to the relative safety of 14th place in the English Premier League but also the final of the English Capital One Cup against Manchester City. With the exception of its English Capital One Cup semi-final second-leg loss at Manchester United, which felt like a win, Sunderland won six and drawn one of its last seven games. A run like that would be heaven sent for Hull, which has slid slowly down the English Premier League ladder recently. Hull has beaten only bottom club Fulham, admittedly 6-0, in its last 11 top-flight matches and its goal-scoring problems continue. It was a miracle that Hull gained promotion with such a lightweight attack last season and, unless the Tigers find their shooting boots soon, they could end up back in the English Championship after one season among the elite. Finally, Cardiff is well over the odds at 5.00 with Betfred to do the English Premier League double over Swansea in one of the top derbies in the United Kingdom. Something is not quite right at Swansea – Michael Laudrup is the favourite to be the next top-flight boss to be axed – and Cardiff under Ole Gunnar Solskjaer are likely to play with relative freedom. There is nothing to choose between Swansea and Cardiff based on their recent results so it is crazy that the Swans are well into odds-on territory. Cardiff should be trading at odds of around 3.50 so odds of 5.00 are worth a nibble.